Fresh paint, laminate flooring, track lighting, new tile tub enclosure & clean matching appliances. Ready to move in now. 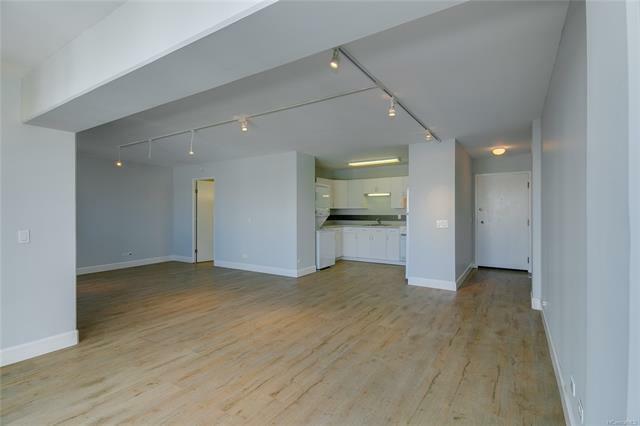 This large studio was originally a 1 bedroom & could very easily be made a 1 bedroom again. A corner end location provides windows on 2 sides of the bedroom making for nice cross breezes. Convenient parking stall is a short walk to the secured lobby. Across the street from Punahou School, a block to Maryknoll School & very close to University of Hawaii and Roosevelt High School. Close to everything Honolulu has to offer, but set a world apart. Very close to convenient bus lines. Pets need to be pre-approved by the board. Listings provided courtesy of Nexthome Ku Realty. Based on information from the Multiple Listing Service of HiCentral MLS, Ltd. Listings last updated on 2019-04-20T19:58:49.55. Information is deemed reliable but not guaranteed. Copyright: 2019 by HiCentral MLS, Ltd.